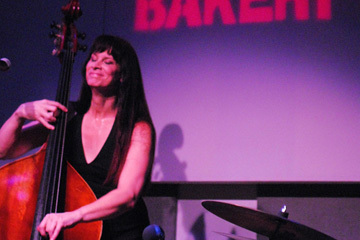 Over the course of more than two decades, Jennifer Leitham, then John, built a successful career as a jazz musician; a virtuoso on the upright bass who played in the Tonight Show Band and toured with both Doc Severinsen and with Mel Tormé for years. Leitham’s youthful energy and pageboy haircut were distinctive, as was the choice to play the hefty upright bass left-handed, a highly unusual orientation for the instrument. Though successful professionally, Leitham had been living a fractured life: as John out in the world and as Jennifer at home. In 2005, that all changed, when Leitham underwent sexual reassignment surgery and fully embraced life as Jennifer. Andrea Meyerson, who has documented outstanding performers from Kate Clinton to Bruce Vilanch in her Laughing Matters series, delivers another intimate and engrossing film. Step on stage with this talented and self-confident woman as she shares her challenging and courageous journey, revealing all of the self-doubts and fears, risks and rewards and joys and disappointments that her transition entailed. In the often homophobic, male-dominated world of jazz, the challenges are great, but, for Jennifer, the music will always be paramount. For her whole life “music was the equalizer; it gave me an activity that could go to—and survive.” Join Jennifer and a slew of jazz luminaries including Doc Severinsen, Ed Shaughnessy, Roy McCurdy, Denny Tedesco, Sweet Baby J’ai and Gary Chen for an uplifting personal story of liberation with a cool jazz soundtrack.